This entry was posted in Tollywood and tagged Ammoru, Babu Mohan, Baby Sunayana, Kallu Chidambaran, Kodi Ramakrishna, Rami Reddy, Ramya Krishna, Soundarya, Suresh, Telugu, Tollywood, Vadivukkarasi. Bookmark the permalink. the screen caps might have taken a lot of time of yours.. but they just add the brightness to this review.. And I agree with most of the points mentioned here..
1995 was when I was 10yrs old and as a kid I was scared and couldnt sleep that night after watching this movie..
Ah yes, I did go a bit overboard 😀 I’ve watched this a couple of times now but still got distracted by the story when I was supposed to be screencapping and had to keep going back to the bits I wanted. I can imagine this would have been pretty scary for a 10 year old! The things that happen to Bhavani and the final scene at the temple are graphic. Great review Temple! I didn’t watch this until much later than 1995. But, the trailers were enough to scare kids. I always found it funny that Baby Sunayana’s name means “good eyes”. This whole movie is about eyes. Just the look (both by Sunayana and Ramya Krishna) scares. The meanness is also just horrible. There have been other movies of this genre but this is the best executed one. This movie made Soundarya a star taking her from ‘second heroine’ level to super star. I feel a little sad that Ramya Krishna’s acting talents go so unused in rest of the Telugu movies. She goes from kindness to fierceness in seconds. Thanks Violet 🙂 I’m always happy when I stumble over such a great film! I agree about Ramya Krishna. She is particularly good in the introductory segment where she says little but her eyes tell the whole story with just an arch of an eyebrow or a slight change of expression. I also have to admire the commitment with the bloody eyewash she sported for several of her appearances. I had a look over her filmography and I have seen a few of her movies but this is a standout. Are there any you would recommend? Padayappa in Tamil, (dubbed ‘Narasimha’ in Telugu) is one of the movies that made Ramya Krishna stand out with Rajinikanth. It is a good entertainer. 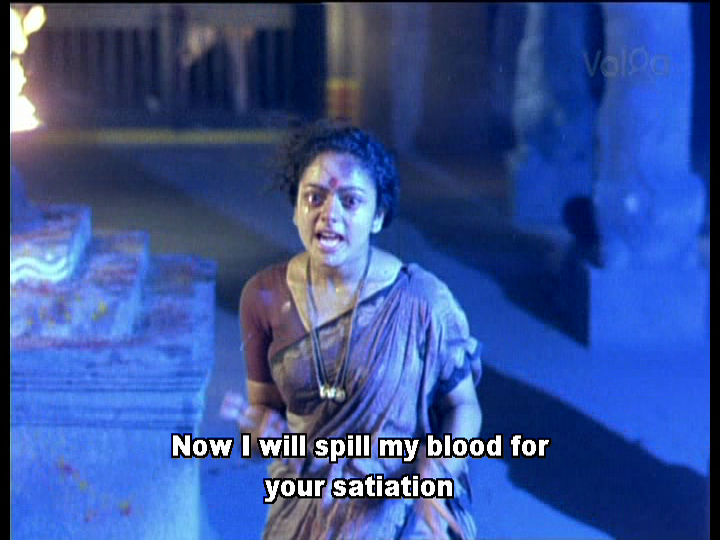 Annamayya, (Nagarjuna, 1997) is another devotional where she did well. Both movies have done well and very entertaining. Agree with Violet… Narasimha and Annamayya… also try Ahwanam.. heard its a good movie.. The baby sunayana expression is so good.even thought she was a child artist she did well her character. No words 2 her expressive eyes.I like 2 see her .That how she looks now can any one send a picture of her .The 1995 Ammoru to 2016.